Stamps by: Ladybugs and Just for You by Posh Impressions; Sing and Dance by Darcies. 1. Here we go again with an accordion card!! However, this one is going to be different than the Philosophy of Friendship card. When you put these panels together, you want the two outer panels to fold inward. As the card is sitting on the table, it will display the side panels at a forward angle from the center panel. Let me know if this does not make sense. 2. Align the cards as you wish. Double stick tape one of the panels. Position the appropriate panel onto the tape and secure. 3. Layer the decorative papers and cardstock to the three main panels (2, 3, 4). 4. Detail trim the ladybugs (they are not on cardstock). 6. Layer the sayings onto the decorative paper. Sing and Dance needs to be trimmed quite closely so that all the layers will fit. Attach to the main card. 7. As you fold up the card, fold the far right panel in first. The sing and dance panel will be showing (picture number 2). Then fold the left panel over that. The cover or Just for You panel will then be on top. As the recipient of the card opens it, the sayings will be expressed and then the ladybugs will be shown!! 8. Pretty simple, but very fun!! Stamps by: Butterfly by Posh Impressions; sayings by Penny Black and Stampendous; Envelope Butterfly by Post Impressions. 1. Sometimes we do more of the card for you than we mean to! That is why the butterflies in the initial mailing are already mounted on the support stock!! 2. Detail trim the butterfly. 3. Layer the cardstock and decorative paper to the main card. 5. Push up the wings of the butterfly so that it has some dimension. 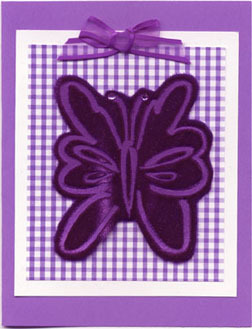 Apply glue to the body part of the butterfly (on the cardstock) and position onto the card. 6. Using the dries clear adhesive, glue on the rhinestones and bow. If needed, use a clothespin to hold the bow until it is set. 7. Again, easy but very nice!! Stamps by: Magnolia, Butterfly, Sayings by Posh Impressions; other sayings by Printworks, Darcies. 1. Both butterflies and the magnolia need to be placed onto support stock. Then, detail trim. 2. The leaves are NOT on support stock. Detail trim. 3. Layer the cardstock and papers onto the main card. 4. 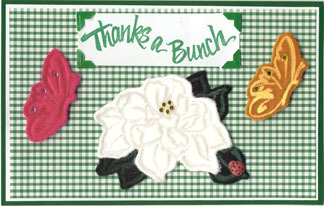 Place the corners onto the "Thanks a Bunch" piece. Remember that these corners are more for decoration than function, so be sure to place tape on the back of them. Attach to the main card. Be sure to place it very much toward the top of the green gingham so that the magnolia will fit!! 5. Lay the leaves onto the card with the Peel'n'Stick still attached. Lay the magnolia over the leaves. Then, attach the leaves one at a time using the magnolia as a guide. 6. Using the 1/16 inch pop dots, attach the magnolia to the main card. Remember that pop dots will not stick to velvet, so be sure to place them appropriately. 7. Using the 1/8 inch pop dots, attach the butterflies to the main card. 8. Complete the inside of the card. 9. Using the dries clear adhesive (and tweezers), glue on all the rhinestones and the ladybug button. Allow to dry! 10. Next week's project will be delayed a few days--sorry for any inconvenience. 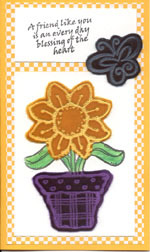 Stamps by: Bee, Sunflower, Leaf Duets by Posh Impressions; sayings by Posh Impressions, Darcies, Printworks. 1. Layer all velvet images EXCEPT THE LEAVES onto support cardstock. Detail trim. 2. From the black sunflowers, you need to cut the centers out fully. Also, you need the "length" pieces in one piece (make sense???). So cut them from the sides. 3. Layer the cardstock and decorative papers to the main card. 4. Preliminarily lay your design out. Then piece by piece (from the bottom), start assembling. The leaves are right to the card. The bottom Aztec gold sunflower is on the 1/16 pop dots. The black accent sunflower pieces are on with 1/8 pop dots. ****At this point you need to keep in mind that the pop dots will not stick to velvet, so you need to pay closer attention to your pop dot placement. The top sunflowers are on with 1/4 pop dots. 5. Using 1/8 or 1/4 pop dots, attach the bees. 7. Using dries clear adhesive, glue the black centers to the top sunflowers. Allow to dry. Stamps by: Hope by DeNami; Rose by Parked on Rubber; Sayings by Darcies, Eureka!, Printworks, Double D.
1. All images are on support cardstock. ***NOTE: the rose and the stem need to be preliminarily trimmed closer than usually before going onto the support stock. Then, they need to be lined up when attached to the support stock. Detail trim. 2. Layer the cardstock and papers to the main card. Remember that the corners are more for decorative use than functional, so be sure to secure with tape or glue before placing down. 3. 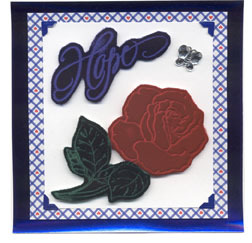 Using the 1/8 pop dots, attach the rose to the main card. 4. Using the 1/16 pop dots, attach the Hope to the main card. 6. Using the dries clear adhesive, glue on the rhinestone butterfly. Allow to dry. Stamps by: Sunflower by Impressive Stamps; Pot and Leaves by Darcies. 1. Detail trim all the images. 2. Lay out your design as you wish. 3. Remove the Peel'n'Stick and attach the images to the shirt. 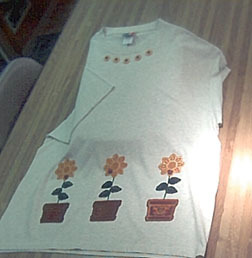 The "ribbon stems" are not attached to the shirt in anyway other than with the Peel'n'Stick of the sunflower and the PNS of the flower pot. 4. Using a dries clear adhesive, glue the ladybug buttons onto the the sunflowers and allow to dry. 5. For the sunflower buttons, you may use a dries clear adhesive to glue them on permanently or use Peel'n'Stick to apply them temporarily. 6. After you wear the garment, remove the "temporary appliqués" and place then on freezer or wax paper until you wish to use them again. 7. If you glue the buttons on permanently, you will need to hand wash the shirt. 8. This is a totally different project for us--we hope you love it!! Sorry the pictures aren't that great!! Our digital camera was very inexpensive and it does do the job for as little as we use it!! 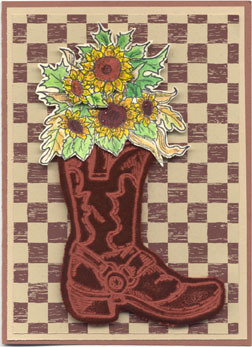 Stamps by: Boot by Rubbernecker; Sunflower/Leaves by Sonlight; Sayings by Anne-ticipations and the Stamp Pad. Other layering papers 1/4 inch less than the previous paper. 1. Cut out the sunflower/leaves image. Color and allow to dry. 2. Place the boot on support cardstock and detail trim. 3. Layer the decorative paper and cardstock onto the main card. 4. Using the 1/16 inch pop dots, attach the boot to the main card. 5. Using the 1/8 inch pop dots, attach the sunflower image to the main card. 7. Apply glitter glue to the sunflowers and allow to dry. Stamps by: Potted Sunflower by Impressive Rubber Stamps; Butterfly by Stampendous! ; Sayings by Printworks and Anne-ticipations. 1. Color the leaves and stem of the stamped image. Allow to dry. 2. Detail trim all the images. None are going on support cardstock. *****Except for where the stem joins the sunflower, leave a nice (proper) border on the sunflower. 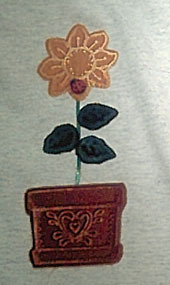 If you cut to close, you will have a hard time fitting the velvet sunflower over the stamped sunflower. If this does happen, color the stamped sunflower before putting the velvet sunflower on--this will allow everything to blend in. 3. Layer the decorative paper and cardstocks onto the main card. 4. Remove the PNS and place velvet images onto the main card. 5. Complete the inside and the envelope. 6. This card is way easy, put remains one of my favorites!! Stamps by: Background leaves by Anne-ticipation; Bushel Basket by Azadi; Tree by Personal Stamp Exchange; Sayings by Anne-ticipations and The Stamp Pad. 1. 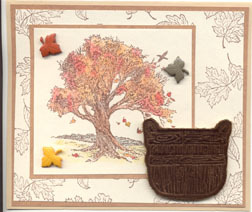 Place bushel basket image on support cardstock and detail trim. 2. Using colored pencils (or watercolor crayons) color the scene. ***You could also color the background paper (leaves), but when I tried it, I decided I liked it better not colored. 3. Layer the cardstocks onto the main card. 4. Position the bushel basket and adhere to the card with pop dots. 6. Using the dries clear adhesive, glue the leaf buttons onto the main card. Allow to dry. Stamps by: Hay Ride and Sayings by The Stamp Pad; Velvet leaves and acorns by Posh Impressions; Background leaves and sayings by Anne-ticipations. 1. Place the velvet images onto support cardstock and detail trim. 2. Color the main scene. 4. Using the pop dots, adhere the leaves and acorns to the main card. 6. Two very easy cards, but they certainly have me in the spirit for FALL!!!!! Stamps by: Birdhouse, Birdie by Darcies; Holly, Saying by Hero Arts; Saying by SonLight. 1. Detail trim the birdhouse--it is NOT going onto support stock. 2. Place the bird onto support cardstock and detail trim. 3. 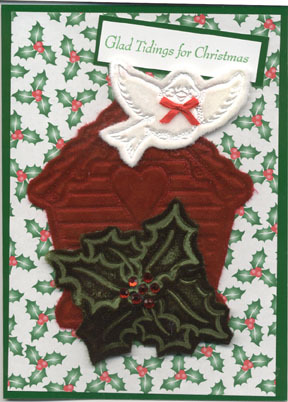 Place the holly images onto support cardstock, then onto Peel'n'Stick, then detail trim. ****If you have limited strength in your cutting hand, you can do one layer of cutting at a time. 4. Layer the decorative paper onto the main card. 5. Attach the birdhouse to the main card. 6. Position the bird on the top of the house. It is attached to the main card only with pop dots. Remember that the pop dots will not stick to the velvet, so your placement is very important. You may want to put the dots onto the card and then attach the bird. 7. Place the sign the bird is "holding" onto the main card. 8. Peel the PNS off the holly images and position them onto the birdhouse overlapping the "berry" section. 9. Complete the inside of the card. 10. Using the dries clear adhesive, glue on the rhinestone berries and the birdie's red bow.